UPDATE: The National Movement for the Liberation of Azawad (MNLA) also announced today that it was ending a ceasefire with Mali’s government. This announcement by the Tuareg rebel group followed clashes between ethnic Tuareg and Malian security forces in Kidal yesterday, which prevented the country’s Prime Minister, Oumar Tatam Ly, from making a planned visit. The MNLA said that the actions by Malian forces amounted to an act of War. At the beginning of the month the MNLA, along with the the Arab Movement of Azawad (MAA) and the High Council for the Unity of Azawad (HCUA), announced they were forming a new coalition. What affect this declaration by the MNLA might have on the activities of those groups is not known. French forces in Mali detained a low-ranking member of Al Qaeda in the Islamic Maghreb (AQIM) yesterday during operations. Alhassane Ould Mohamed, who is also known as Cheibani Ould Hama, was one of twenty-two prisoners who escaped in June from Niger’s central prison in the capital Niamey. There Mohamed had been serving a twenty year prisoner sentence for his involvement in the killing of four tourists from Saudi Arabia in 2009. However, US authorities have also been looking to charge Mohamed in connection with the shooting of US Department of Defense attache, William Bultemeier, in Niamey in December 2000. According to an indictment in a court in New York City, Mohamed and an another unidentified individual attempted to carjack a vehicle being driven by Bultemeier. A Marine Staff Sergeant, Christopher McNeely, was also in the vehicle. Both men were killing in the altercation. Mohamed was subsequently arrested, but escaped custody in 2002. He was arrested in Mali in 2009, before being deported to Niger to stand trial for the killing of the Saudi Arabian tourists. Mohamed was reported to have been turned over by French forces to Malian authorities. One would imagine that his record of escaping custody would lead the US to seek his extradition. Mohamed’s capture follows the arrest of Mali’s General Amadou Sanogo, who led the coup that toppled the country’s government in March 2012. Sanogo was charged with murder for his alleged involvement in killing of individuals involved in a counter-coup attempt in April 2012 and deaths during the suppression of an Army mutiny in September 2012. Sanogo had only recently been promoted to the rank of general, skipping three ranks in the process, suggesting he retained considerable influence in the country. Despite having transitioned to civilian leadership, Mali’s government remains fragile and relies heavily on international forces to provide security. France provides the bulk of this contingent, though they hope to turn over the mission to African-led UN-mandated forces early next year. This move has been delayed by difficulties in getting the UN-mandated force established, however. With the additional planned increase in French forces in CAR, France is redeploying over three hundred military personnel from its contingent in Kosovo. The force in CAR is also intended to be an interim solution until an African-led UN-mandated force can be established some time next year. France currently has approximately four hundred and fifty personnel in CAR, who are working to expand the capabilities of the country’s single-runway airport in advance of the planned reinforcements. A french warship, the Mistral-class amphibious assault ship Dixmude, docked today in Douala, Cameroon. Dixmude was transporting a contingent of three hundred and fifty, along with vehicles and other equipment, bound for CAR. Dixmude had also ferried forces to Mali in January at the start of Operation Serval. 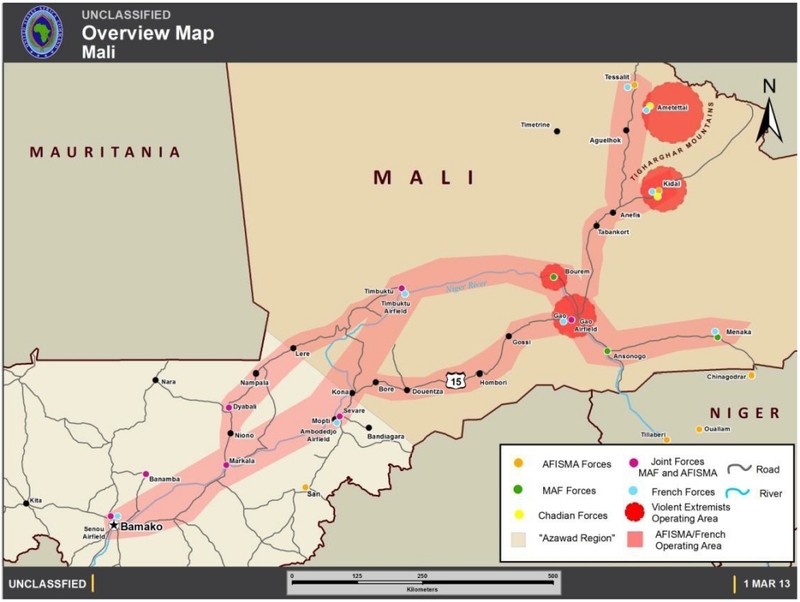 The US also supported efforts to ferry international forces and materiel to Mali as part of Operation Juniper Micron. It is not known whether France may call on the US to help support the build-up in CAR. After several days of talks in Burkina Faso, Mali’s National Movement for the Liberation of Azawad (MNLA), the Arab Movement of Azawad (MAA), and the High Council for the Unity of Azawad (HCUA) announced on 5 November 2013 that they had tentatively agreed to form a common negotiating committee and joint decision making body to put forward a common negotiating position in talks with the central government. The merger is reported to be set to come into affect in forty-five days, giving time for the groups to consult with their membership and approve the agreement. The announcement was viewed as an attempt to jump-start peace talks in Mali, which had been resumed in October, but were suspended again after rebels walked out. Fighting has since resumed, primarily in and around the area of Kidal, the same town in which two French journalists were abducted from this past weekend. The journalists were later killed. Rebels in Mali’s north are primarily fighting for greater autonomy in the desert region where the government continues to exerts little control. This is also not the first time Tuaregs and Arab groups have forged alliances in their battles with the central government. In May 2012, it was reported that the MNLA had aligned itself with the Salafist group Ansar Dine to form the Council of the Islamic State of Azawad. This group won notable victories in the latter half of 2012 prompting an international response, which was led by the French and supported by the United States. Ansar Dine’s push for Sharia Law in Mali’s north had been a major obstacle between them and Tuareg groups prior to the agreement to form a coalition in 2012. As the pair began to secure areas in Mali’s north, reported pushes to convert Tuareg tribesmen to their stricter brand of Islam caused divisions between the MNLA and Ansar Dine again. It is unclear whether any common negotiating position would fully address this issue.